Thoughts That Go Bump in the Night: Restoring Faith in the Oscar! Restoring Faith in the Oscar! It's a bright, sunny day in Shreveport as a host of folks turned out to celebrate William Joyce, Brandon Oldenburg, and the Moonbot Studios Oscar for 2011 Best Animated Short Film. What better way to honor and cheer the creative team behind the delightful film than a "ticker tape parade" in downtown Shreveport. Of course, confetti can't be tossed from sealed windows in tall buildings, but it can be fired from ground air canon with good effect! 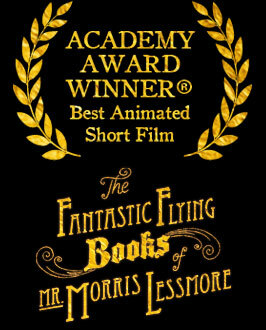 The Oscar winning The Fantastic Flying Books of Mr. Morris Lessmore is the brainchild of award winning illustrator William Joyce. 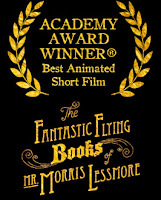 The engaging tale is a personification of books, treasures, and time. Life is more fun when personified, and Joyce does that in the film. It's described as Buster Keaton swept up by Hurrican Katrina, landing in Oz and learning the curative power of stories. It is absolutely charming! Thanks, Bill, for a great show! And, there's always the parade!